You have reached the decision to look and buy a property/home, but how do you buy a house in the UK? Where do you start? What do you need to do first? Aside from choosing how many bedrooms you would ideally like there is a maze of legal paperwork, negotiations with Estate Agents, Solicitors and Surveyors, not to mention trying to find the best mortgage deal. 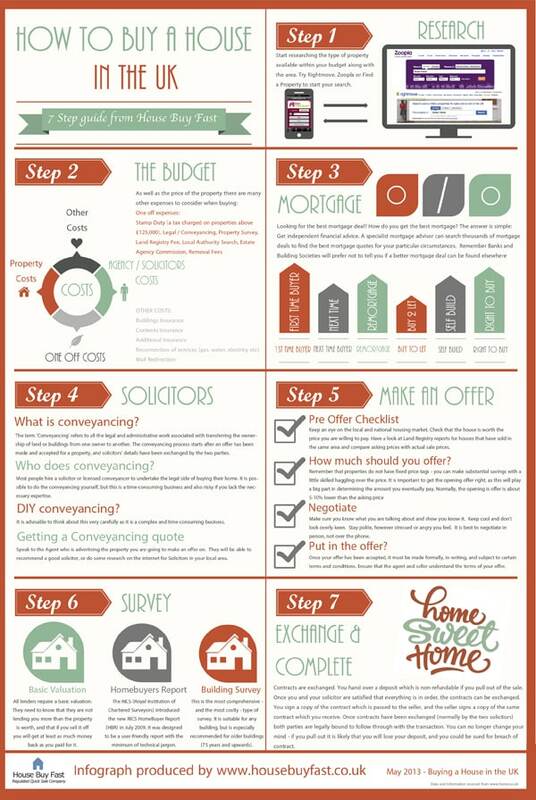 This handy infographic from House Buy Fast has a check-list of what you need to do and when to ensure that you have everything in place to get you onto the property ladder once you find that dream home. It's one of the most stressful and biggest financial decisions you will ever have to make, it's a lengthy and complicated process. We have plenty of property advice on hand for you to try and make the experience as problem free as possible. Remember, finding your dream home is the easy part, it could take weeks or even months to complete the process so be patient, the key is to ensure you are prepared before you start even looking to buy. Last updated on 04/06/2013 by Jonathan Rolande.